Guildford, an authentic 16th-century Tudor residence, sits majestically on 18 park-like acres with sweeping vistas and spectacular sunsets overlooking the neighboring valley and is delightfully close enough to walk to the heart of Philadelphia’s acclaimed Chestnut Hill community. Photography by Michael Hirsch and Travis Mark. Gunite pool and spa in private setting close to kitchen. Outdoor fireplace adjacent to spa. Although Elkins would not live to see the completion of his home in 1925, he intended the home to last for centuries. Guildford’s entire substructure, including the roof, is made from thick, reinforced concrete, amply supporting all of its timeless architectural elements. The antique brick walls and terracotta window frames, ancient carved wood paneling, elaborate cornice work, antique oak floors, limestone archways and walls, leaded glass windows, metal downspouts dated 1589 and red tile roof all dazzle as they did when they were originally installed. The interior light at Guildford is abundant and both morning and the late afternoon sunlight sparkles through the precious stained-glass ornaments that decorate many of the windows like jewels from the time of Shakespeare. The generously proportioned rooms, high ceilings and axial layout make this home perfect for gracious entertaining as well as an elegant, cozy and welcoming home for family and friends. Period English gardens, woodland paths and sweeping rolling vistas from the western terrace perfect the illusion of the English countryside and inspire the feeling of being transported to another place and time. Morning sunlight glows on the ancient river stones of the front entry court and evening sunsets delightfully color the breathtaking views from the western terrace. The charm of Chestnut Hill fits perfectly with this timeless residence. Less than a mile from the village, Guildford offers a rare quality lifestyle for a property of this size. Less than 30 minutes to central Philadelphia and 90 minutes to Manhattan, Chestnut Hill is known for its quaint cobblestone streets, artisanal shops, art galleries, local train stations, top private schools, protected park land trails, award winning restaurants, golf and tennis clubs. The large courtyard which faces the front of Guildford is set with river stones from England’s River Wey, in Surrey. Great slab stone floors are from England's Warwick Priory in London, dating back to the 12th-century. The 16th-century linen-fold paneling on the walls is from a manor in Norfolk, England. Linenfold carving was a signature of fine homes in Tudor England, as is the case here. Terracotta carvings of amorini above Guildford’s west entrance doors are identical to those at Sutton Place in England. The richly carved historic oak entry door dazzles as does the ancient limestone entry arch, also known as “Willoughby Gate,” which dates back to the 1400s. From Cassiobury Hall, the home of the 2nd Earl of Essex, Robert Devereux, one of Elizabeth I’s closest advisers. Elizabeth I is said to have visited this room during her reign, marked by the stained glass window bearing the Queen’s Tudor Rose emblem. Georgian Period 18th-century honey-toned pine paneling from Felling Hall, Northumberland. The pair of carved niches are attributed to Grinling Gibbons, the most famous English wood carver of his day. 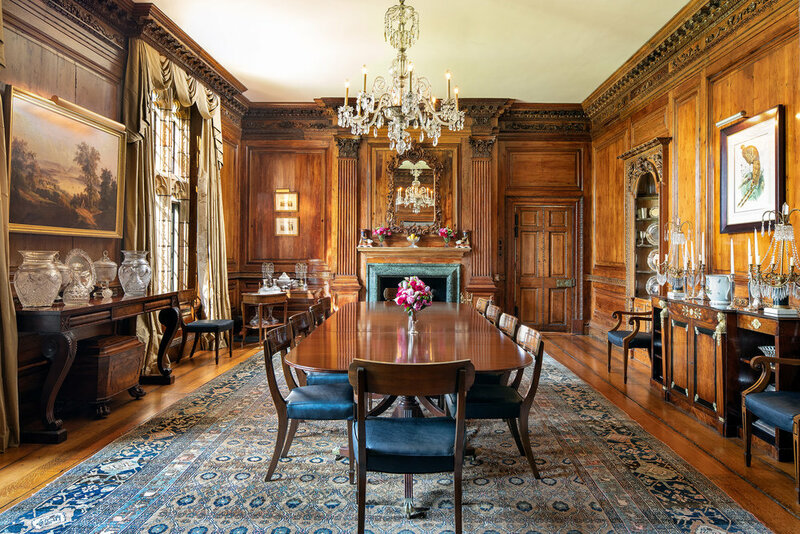 Known as “Pope's Parlor,” this room from Battersea-on-Thames, is paneled in 16th-century Cedar of Lebanon wood and once belonged to Sir Henry St. John, Lord Bolingbroke. Famed writer Alexander Pope is said to have written his Essay on Man in this room. Guildford is ideally located within walking distance to the charming center of the village of Chestnut Hill, with its cobblestone streets and chic boutiques. The area is also home to highly rated schools, the renowned and storied Philadelphia Cricket Club, Wings Field private airport, three commuter train stations and in close proximity to Manhattan. Abuts The Wissahickon Valley Park’s 1,800 acres of walking, biking, hiking and riding trails. Chestnut Hill cultural highlights include The Woodmere Art Museum, The Morris Arboretum, and The Pastorius Park Summer Concert Series, which is the longest running outdoor concert series in Philadelphia. Zagat-rated restaurants such as Jansen and wonderful boutiques for shopping.